When I think back to my first serious attempts at writing, I wasn’t sitting down and writing a poem because I thought that I would get published; I was doing it because of that abstract, inexplicable urge to create, and the urge to find self-expression in this act of creation. Writing was the outlet that I would return to again and again to explain my life to myself, to take the maelstrom of ideas and emotions and create something ordered and tangible. This freshly pressed post from Anna Spanos is great. I only just discovered her blog and my thoughts here are my own interpretations–they might be totally inaccurate. But then, I believe readers should be empowered to draw their own lessons, regardless of author intent, so I will forge blindly ahead. For Spanos, the forced prioritization of busy mother/wife/middle-management-hood has had a counterintuitively freeing effect on her writing. As she eloquently puts it, she has by necessity eliminated the time she spent on less important things. She is no longer “handcuffed” to the time and effort spent considering the critical reception of her work. She has, at least momentarily, escaped the egoism that weighed down her art back when her art was the thing that defined her most. Spanos’ post illuminates a tension in my own blogging project. An essential part of starting this blog was the desire to anchor myself back into my creativity. I started writing when I was in junior high and kept writing, prolifically, and all for the “inexplicable urge to create,” for years. Law school stopped all that. I like being an attorney and I find legal research and writing fulfilling in a way that many of my peers find bizarre, but it is the antithesis of the creativity I engaged in before law school. Law school was an oyster that treated my creative urges like a grain of sand. I know they are still there, they are still beautiful, but they are encased in an impenetrable shell at the moment. My first post-law-school blog was an attempt to dive back into my creativity, but it sputtered and died within a few weeks. It felt alternately too preachy and too frivolous. In this second endeavor, I’ve tried to craft an experiment with more structure and deeper roots. There are real, positive goals that I hope to accomplish here, goals that have nothing to do with anyone but myself. Goals that have a lot to do with “tak[ing] the maelstrom of ideas and emotions and creat[ing] something ordered and tangible.” Yet writing to get in touch with my own voice feels peurile. Like my disastrously melodramatic college Xanga account. So I hope that someone out there will find value and insight in my posts, if only to ameliorate all the navel-gazing I do here. It’s a tension between self-conscious creation to help myself or others, and the purer, painful joy of creating because there is simply nothing else I can do. For now, I hope that practice makes more perfect. 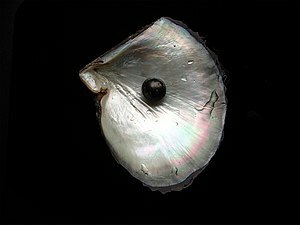 I am the converse of Cleopatra–instead of dropping my pearl in vinegar, I’m dripping vinegar, post by post, onto my pearl, in an effort to methodically dissolve the shell of four years of exclusively professional writing. 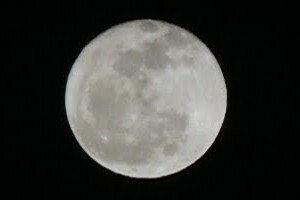 Tonight I was driving home and noticed a huge full moon hanging low in the sky. I always try to take pictures of natural phenomena like this with my cell phone, and am always wholly dissatisfied with the result. Tonight I decided to take a few moments and bring my “real” camera out in an attempt to get a better record. By the time I made it out a few miles past the city lights, the moon had shrunk, but I still managed the shot below. As I sat on the hood of my car taking photographs and messing with the settings on my camera I began thinking about poetry. I used to write a lot of poetry; I miss it. Recently Natasha Tretheway, the U.S. Poet Laureate, had an interview on NPR and it reminded me how much. I came home and composed the verse below. Image and poem copyrighted by me, please ask permission before use. I don’t know the moon at all. A wan reflected pall is the only face I’ve seen. Was she understood by those who walked, in Teflon, on her skin? Or shrouded still in mirrored shine that never entered in? For uncounted generations, how like her we were. Seen from space only by the absence or echo of other light. independently visible through our fearless invention. to pass through this world showing only my own face.